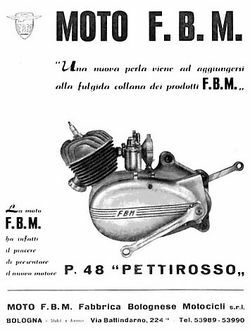 FBM (Fabbrica Bolognese Motocicli) was a company that produced motorcycles that began in Bologna in 1951 and founded by Franco Morini. Franco Morini was the grandson of Alfonso Morini and Vittorio Minarelli who were two of Italy's most successful technicians and entrepreneurs in the production of "two-stroke engines" after World War II. Production began in 1952 with the "Seagull", which had a 125 cc engine two times cantilever mounted on a tubular chassis monotrave. Later it was the turn of the "Vampire", this bike was outfitted with 200 cc four-stroke engine. In 1955, given the general appreciation for the engines and given the multitude of small manufacturers-assembled who were born in those years, FBM he decided to produce Otto cycle engines from 175 cc to be provided Third, and above all two-stroke engines of 50 cc. Thus the "Pettirosso" an engine 2T two gears with a command wire, intended to become the propeller for motorcycles that are most used in Europe. Towards the end of 1956, the founders decided to separate after never clarified "differences", probably due to the understandable difficulties of living in a single company, two similar technical and entrepreneurial talent. Minarelli was renamed "FB Minarelli", while Morini moved at Zola Predosa to give life to "Morini Franco Motori". Both new companies would specialize in building small-displacement engines with two stroke engines, gaining a large and well-deserved success and becoming, in the space of a few years, two true giants of industrial manufacturing and production world.